Develops a full year of reading, math, and early thinking skills. Join Reader Rabbit at camp and help save the party! Reader Rabbit and Mat the Mouse are planning a big campfire party, but all the supplies are missing! Can you help find them? Come along and explore Camp Happy Tails, where interactive puzzles, games, and activities create a fun-filled and suspenseful story. There are plenty of things to learn and places to explore, so let's go! Skills list: Early Reading, Noticing Differences, Simple Arithmetic, Ordering and Sequencing, Problem Solving, Measurement, Critical Thinking, Memory Skills, Directional Words, Time Concepts, Seasons and Months, Social Skills. Special Features: Reader Rabbit's Kindergarten features a suspenseful plot that's full of both short-term and long-term goals. This challenging, rewarding design will motivate your child to play for hours and hours. All activities are packed with progressive levels of educational challenge. Your child will start at just the right level and will gradually advance to new learning challenges! Reader Rabbit products are specifically designed to cover subjects that are appropriate for your child's developmental stage. You'll know that your child will be learning the right educational skills, while gaining confidence and having fun along the way! Find pairs of objects, numbers, and two letter words hidden inside canoes. You're on your way to reading! Decorate four colorful landscapes to understand the differences among the seasons. Pick out fun activities for each time of the day to learn the differences among morning, noon, and night. Search for Papa Bear's hidden alarm clock by using important directional clues like near, far, above, below, and right and left. Organize Pierre's pantry items by size, length, height, quantity, and volume to learn essential measurement, ordering, and sequencing skills. Choose among possible reactions to social situations and see the resulting consequences. Pick the right combination of numbers to help Babs the Beaver cross the stream. The trick is using the rocks, grass, and logs, all of which have surprises of their own! Repair a rickety bridge using simple arithmetic to determine the right number of slats. Choose your favorite camp counselor... for coloring fun! Use a handy list to see how far you've come. Will you find all the missing camp supplies? Included you'll find a Parent's Handbook filled with tips to enhance your child's learning experience, as well as guidance on child development. You'll get helpful advice from The Learning Company- the educational experts with more than 15 years of experience in children's software. 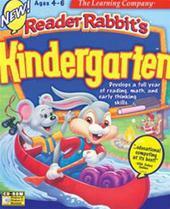 In 1999, an enhanced edition was published as Reader Rabbit Personalized Kindergarten. Its "A.D.A.P.T." technology dynamically adjusts activities to match a child's skills.